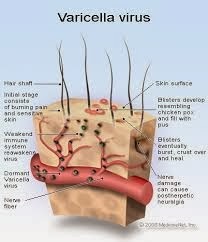 Chickenpox (medically known as varicella) is caused by a virus called the varicella-zoster virus. It's spread quickly and easily through the coughs and sneezes of someone who is infected. Some children have only a few spots, but in others they can cover the entire body. The spots are most likely to appear on the face, ears and scalp, under the arms, on the chest and belly and on the arms and legs. As with children, adults with chickenpox should stay off work until all the spots have crusted over. They should seek medical advice if they develop any abnormal symptoms, such as infected blisters. Adults with chickenpox may benefit from taking antiviral medicine if treatment is started early in the course of the illness. 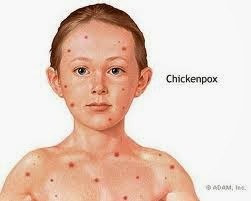 Chickenpox is highly contagious and has three stages. It starts out with the appearance of little itchy bumps all over the body that may resemble insect bites. Then, those bumps turn into blisters filled with fluid, followed by the final stage, which is when they scab over, according to the Mayo Clinic. In addition to the itchy bumps and scabs, chickenpox can also cause fever, headache, dry cough or loss of appetite, according to the Mayo Clinic. The little bumps initially appear on the abdomen or the face in bunches over two to four days, according to the Nemours Center for Children's Health Media. They are less than a quarter of an inch wide (0.635 cm). Chickenpox is caused by the varicella-zoster virus, which is related to the herpes virus. It is highly contagious, starting two days before the bumps even appear, until the blisters scab over, according to the nonprofit Nemours Center for Children's Health Media. It can be spread by contact with the pox, or by an infected person sneezing or coughing on an uninfected, unvaccinated person. Doctors can prescribe antihistamines to treat the itching symptoms of chickenpox. However, if you fall into one of the high-risk groups mentioned above, a doctor may prescribe an antiviral like acyclovir (under brand name Zovirax) or immune globulin intravenous, known as IGIV, to take within 24 hours of chickenpox symptoms, according to the Mayo Clinic. For adults, valacyclovir (known under the brand Valtrex) or famiciclovir (known as Famvir) may also be prescribed. Aspirin should never be given to anyone with chickenpox because the medication has been linked to a potentially fatal condition called Reye's Syndrome, which causes organ damage, according to the Mayo Clinic. There are several home remedies that can help with a typical case of chickenpox. Cool baths, applying calamine lotion, getting rest, eating foods that don't irritate chickenpox sores that may be in or around the mouth and taking acetaminophen (known as Tylenol) or ibuprofen (known as Advil or Motrin), which lower fevers, can all help, according to the Mayo Clinic. It's also important not to scratch to leave scarring. But perhaps the best way to “treat” chickenpox is to never get it at all. 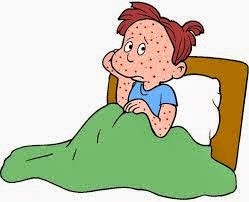 Chickenpox vaccinations are an option for children between the ages of 12 and 18 months, and again between ages 4 and 6 years, according to the American Academy of Family Physicians. It's also encouraged for adolescents and adults, teachers, college students, those in the military, inmates, adult women who haven't yet had children, frequent international travelers and health-care workers who have NOT before had chickenpox to receive the vaccine. Those who should not receive the vaccine include pregnant women, people who currently have a serious illness, people who have before been allergic to the vaccine, people allergic to gelatin or neomycin, people with lowered immune systems and people who may have had a blood transfusion in the last five months, according to the American Academy of Family Physicians. Chickenpox spreads easily. It can spread from 2 days before the rash appears but is most contagious 12 to 24 hours before the rash appears, so it’s easy to spread it without knowing. It usually develops 2 to 3 weeks after contact with an infected person. It spreads from person to person through direct contact with the virus. You can get chickenpox if you touch a blister, or the liquid from a blister. You can also get chickenpox if you touch the spit of a person who has it. The virus enters the body by the nose or mouth. It can also spread through the air. A pregnant woman with chickenpox can pass it on to her baby before birth. Mothers with chickenpox can also give it to their newborn babies after birth. The only way to stop the spread of the virus from person to person is to stop infected people from sharing the same room or house, which isn't practical. Chickenpox doesn’t spread through indirect contact. That means it doesn’t live on objects like sheets, counters or toys. You can catch chickenpox from someone with shingles through contact with their saliva or their skin rash.